Basement is one the most common places to find mold around the house in New Jersey. Besides the obvious health and safety concerns, mold in basement makes it completely unlivable and puts the integrity of your building structure and property value in danger. If you want to regain the control of your basement space, you need to start basement mold removal process before mold spreads out to the rest of the house. Our certified mold remediation specialists at Above & Beyond Unlimited Cleaning will make sure your basement is safe and mold-free! What causes Mold in Basement? How Dangerous Basement Mold really is? Mold in basement can pose a serious health risk due to the lack of proper ventilation. Also, since warm air prefers to travel from the bottom to the top, there is a great chance for mold spores to contaminate the rest of your house in relatively short period of time. Due to the fact that people don't spend a lot of time in their basements, by the time you'll notice you got a mold problem, it is already too late to carry out mold removal in basement on your own. 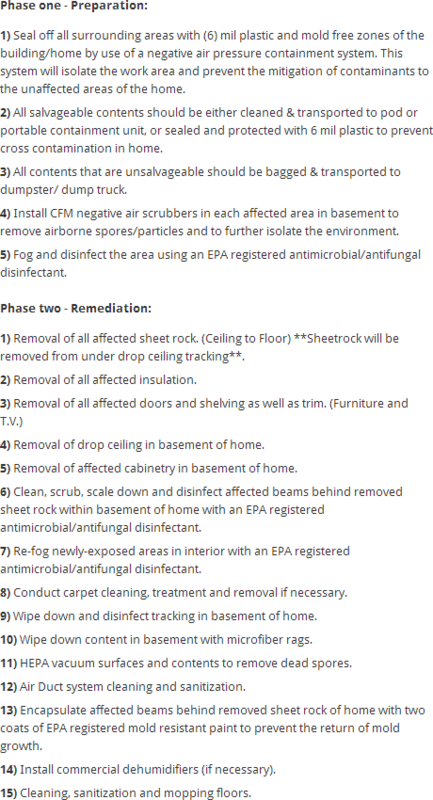 Our basement mold remediation process strictly follows EPA guidelines and utilizes industry best equipment and materials. Check out our sample mold remediation protocol for more detailed information. Call us today to get affordable, hassle-free basement mold removal service from our experienced professional staff. Since 1998, Above & Beyond has made thousands upon thousands of happy customers all over New Jersey and beyond!